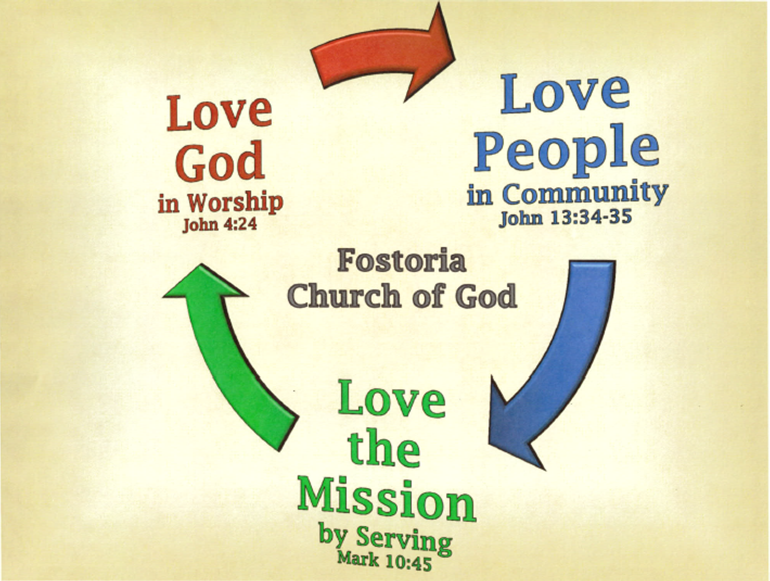 The purpose of Fostoria Church of God is to develop a community of faithful Christians through holistic growth. Growing this community includes loving God (through worship), loving people (through discipleship training) and loving the mission (through servant ministry teams). Fostoria Church of God believes that holistic growth positions Christians to discover a complete life in Christ. The New King James Version (Nashville: Thomas Nelson, 1982), Col 2:9–10. Our mission at Fostoria Church of God is simple. It looks like this: "Love God, love people, love the mission." Each week, the congregation is challenged to complete each step of this mission. That means our people should love God (attend a worship service), love people (attend a life group), and love the mission (serve on a ministry team) each week. It is our sincere desire to move the members of our church toward a complete life in Christ. This is why we encourage members to move from worship environments (loving God) to places of biblical community (loving people) to places of missional engagement (loving the mission). Mission is deeply embedded in our discipleship making process. For this reason we don’t ask people to live at church. We simply ask people to live as the church. The New King James Version (Nashville: Thomas Nelson, 1982), Mk 12:29–31. The New King James Version (Nashville: Thomas Nelson, 1982), 2 Pe 3:18. The New King James Version (Nashville: Thomas Nelson, 1982), Mk 16:15.